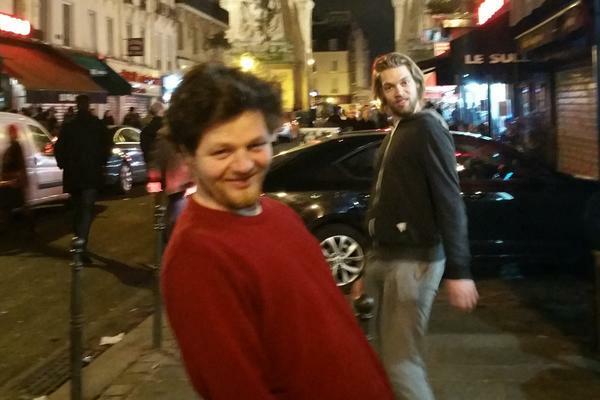 In early spring the West Dean College of Arts and Conservation musical instruments students and tutors went to Paris for a short study trip. After arriving on a Saturday afternoon at a crowded Gare du Nord and then settling into the accommodation, the evening was spent soaking up the ambiance of the city. The next morning started with a tour of the Musée de la Musique: France's leading musical instrument museum, which consists of a comprehensive collection over five floors. Our colleague and friend Craig Ryder, the renowned Parisian bow maker, was accompanying us for the day. After our batteries had been recharged with a light lunch beside the canal he escorted us through the Parc des Buttes Chaumont to view his workshop in the 19th arrondissement. The Musee de la Musique is closed to the general public on Mondays, however we had arranged to meet the curators, Jean Phillipe Echard and Anne Houssay, and spend the day in the museum's laboratory where we examined three instruments from the collection: the Davidoff Stradivarius violin, an arpeggione attributed to Georg Staufer, and a viola da gamba by Michel Colichon. We were made most welcome. Not only did Anne and Jean Phillipe give us their assistance and time throughout the day, but they were also at pains to explain the ethos and protocol of the museum's collection policy. As the collection is owned by the French state, it is fundamental to their thinking that it is made available for study and research purposes. 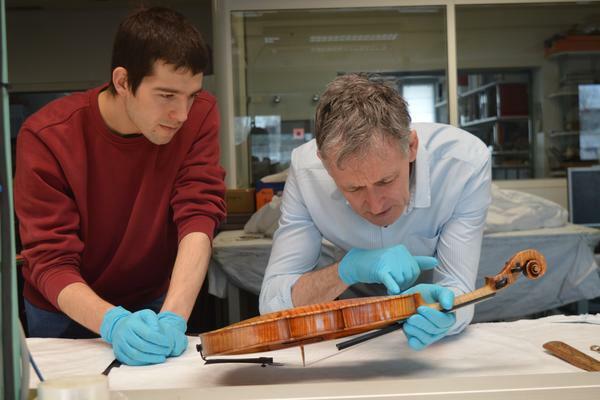 Boris and Shem examining the Stradivarius. Tuesday was spent visiting makers and their workshops. 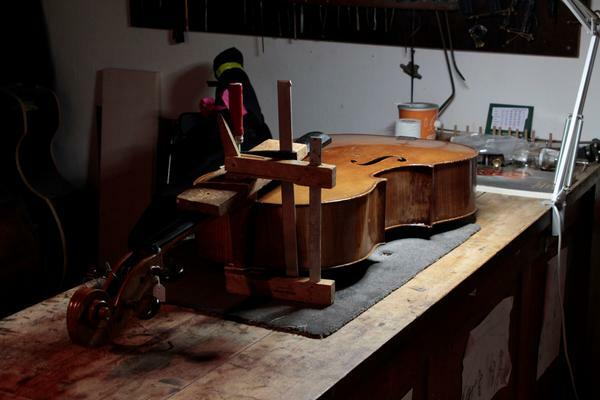 First was the workshop of the viol maker Judith Kraft, followed by that of the viol and violinmaker Clare Ryder Bouvier. 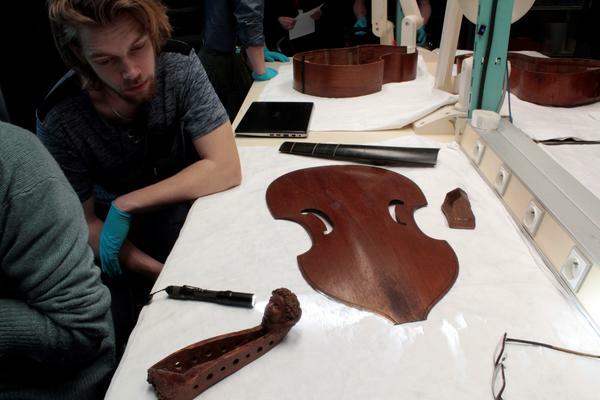 Our final port of call was the guitar restorer Arnaud Legrand who had his workshop in the same courtyard as Clare's. All of the makers we met showed us great hospitality and shared stories of their lives and practices as independent musical instrument makers in Paris.